It wasn’t “Jack” and they were no ordinary ladies of the night……. Good Evening, my chosen fiducial Conspirators. My little game of deception, despite intense public scrutiny, seems to have worked remarkably well for over 100 years, without any fear of detection. And I know that I may trust in you to maintain the utmost discretion in this most delicate of matters; and this, therefore, can be taken as my confession. My name is Sir Mortimer Windsor, and following a highly confidential security alert at Great Scotland Yard in November 1879, I was appointed Royal Privy Convoy and Physician to the family in residence. Had I failed to perform my grisly work so efficiently and effectively, the forces of darkness would have succeeded in casting a long shadow over history. These ladies of the night were in fact vampires, who preyed on the wanton vulnerability of the Saxe-Coburg-Gotha’s male strain, to infiltrate and convert Victorian Britain’s Royal family forever. So you see I had to do it. Didn’t I? Until the next time, I remain your most dedicated servant. The image above of The Whitechapel Messiah, (as Sir Mortimer Windsor was dubbed by the select few), was painted by Queen Victoria’s royal portraitist, James Sant, in his covert capacity as Principle Painter In Camera. As such, Sant was discretely commissioned to secretly paint a number of canvases recording controversially notable episodes which took place during the eventful reign of Victoria, but which the Privy Council considered to be ‘constitutionally delicate’, or too sensitive for general acknowledgement. These paintings have never come into the public domain. Sir Mortimer Windsor, formally a resident of the great Berkshire castle and a distant cousin to Queen Victoria, became an officer in the Light Infantry and served with distinction during the First Boar War. After his return to England he trained as a doctor and his extraordinary aptitude for advanced scientific understanding became apparent. Not long afterwards he acquired consultant status and was appointed Surgeon Royal, and a Fellowship of The Royal Society soon followed. He was quickly recognised for his unique talents as well as his experience and heroic accomplishments on active service, and by 1885 Windsor had been recruited at top level into the Imperial Secret Service. Naturally enough, intrinsically dedicated Royal duties soon followed. Leading a veiled and mysterious existence, Windsor, (who was also Grand Master of the West Wycombe Lodge of Masons), was said to have encountered some dark and strange acquaintances in both his personal and his professional lives. 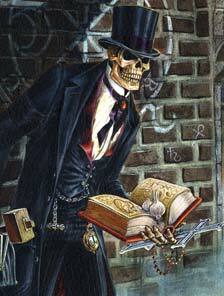 And then, late in 1888 in Whitechapel, London, the most gruesome of stories broke into the headlines. 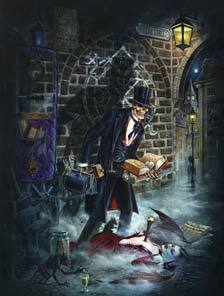 In a paralysing grip of fear, the phenomenon known as Jack The Ripper took hold of the City. The Illustrated London News reported "A Suspicious Character" being seen around the scenes of ‘crime’. There was little that could be done at the time, given the surprise of the encounters and the speed and ferocity of the altercations, to deny the evidence of such carnage. In fact, the repeated spectacles of gore became so emotive that public speculation and rumour soon (and conveniently), cultivated a myth that was to provide perfect cover for these ‘Ghastly Murders’ and what was otherwise an inexplicable cataclysm. Solicitors By Appointment, Foxcliffe & Haviscope, acted on behalf of the Royal Household denying any knowledge of or connections to the fateful incidents. Amongst all the controversy, quite contrary to the official and popular ‘Juwes’ myth, the ‘graffito’ tactfully removed by the Metropolitan Police from a wall at the Mitre Square scene was in fact a Masonic variant of the Cabalistic Seal of Murmus, spirit and night demon possessing the powers of philosophy and interrogation of the dead. This, poignantly, leads us in the direction of the true explanation for the most famous serial killer of all time. The well-known hereditary tendency towards haemophilia within the Royal Family is a direct result of a concerted, strategic attack upon them, beginning some time in the late 19th Century by a vampire; an obscure Romanian noble of the House of Tsepesh, dynastic control of the Civilised World being his ultimate objective. Prince ‘Eddy’ Albert Victor, (Queen Victoria’s grandson), was, at the time of the murders, the principle ‘soft target’ for the antagonists, being prone to libertine improprieties. The dastardly plan of family infestation by carnal seduction was already underway and came perilously close to success through Prince Eddy, (who mysteriously died, circa 1891, of ‘insanity’ while in confinement). Sir Mortimer Windsor, suffice it to say, was asked to ‘take care of the situation’, at all costs, which, to our unerring gratitude, he so admirably did.